Further education trade unions have met twice in the last week to discuss an ongoing pay row with the Association of Colleges (AoC), FE Week can reveal. Unions in attendance were Unison, the University and College Union (UCU), The Association of Teachers and Lecturers (ATL), the Association of Managers in Education (AMiE), Unite and the GMB. They met on Friday, January 15, to discuss the AoC’s decision to offer no pay rise for 2015/16 and to consider possible industrial action strategies. They met again on Monday, January 18, this time with the AoC present, a spokesperson for Unison confirmed. Unite national officer for education Mike McCartney said: “Unite strongly deplores any proposals for a pay freeze for the year 2015/16. The meetings follow Unison’s announcement that its latest ballot of FE workers in England will close at the end of January. The ballot opened on January 6, asking college workers to vote on industrial action in response to the AoC offering no pay rise for 2015/16. Unison has already carried out a consultative ballot of members on the pay freeze, the results of which were announced in October, with 95 per cent of those voting rejecting the offer. Unison wrote to individual colleges asking them to make a better local offer, but only 12 providers made improvements and more than half did not reply. A UCU spokesperson told FE Week that the unions have now agreed to wait until the results of the Unison ballot, before deciding further steps. Andrew Harden, head of FE at the UCU, said: “Our invitation to sit down with the AoC to discuss the current pay dispute remains open, despite their recent refusal to talk. 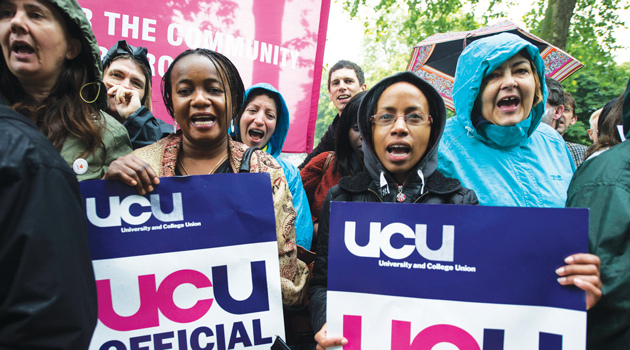 The UCU held strike action in November last year in response to the proposed pay freeze, with 207 colleges affected. The strike was announced in October after no agreement was reached in talks with the AoC. A prior UCU ballot on the pay freeze had resulted in 74 per cent of the members who voted (4,184) backing industrial action. Meanwhile, ATL previously held a ballot on the issue, but said members were reluctant to pursue industrial action. A spokesperson confirmed the union’s position remains unchanged. The AoC said there was “no update” at present and the GMB was contacted but gave no response. The National Union of Teachers has also put out a consultative ballot to 93 sixth-form colleges (SFCs) across England, over the issue of real-terms cuts to funding. If members vote in favour of strike action, a formal ballot will be held in February over whether to hold a national one-day strike. David Igoe, chief executive of the Sixth Form Colleges Association, said the call for strike action was “unfortunate and misplaced”. “It is damaging what is generally a constructive industrial relations climate in our sector, at precisely the time we were making some headway with Government,” he added. The article states the trade unions met to discuss the AoC’s decision to offer no pay rise for 15/16 but the AoC does not offer pay rises. As far as I am aware, the AoC makes a recommendation which colleges may or may not adopt. I am not surprised that the AoC recommendation was for a 0% payrise given the significant cuts and low inflation. I’m sure I would rather have a pay freeze than find myself in a redundancy pool. The trade unions must be living on another planet.